At the invitation of Foreign Minister Don Pramudwinai of Thailand, State Councilor and Foreign Minister Wang Yi will travel to Thailand for strategic consultation from February 15 to 16. Q: According to reports, US Special Envoy to Venezuela Elliott Abrams said on February 13 that China may stop offering loans to Venezuela due to concerns that the country won't be able to repay its debt. What is China's comment? A: I have made my position clear many times on China-Venezuela cooperation. Here I'd like to reiterate that China-Venezuela relations are normal state-to-state relations. Our practical cooperation, following the principle of equality, mutual benefit, common development and commercial rules, is lawful and beneficial to our two peoples. 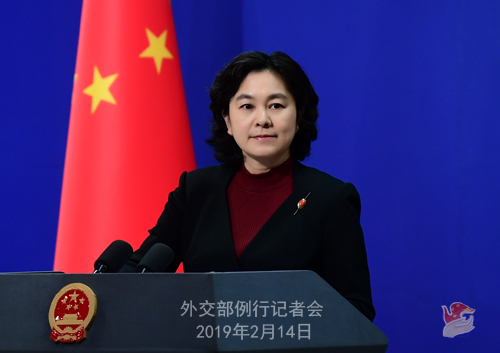 China will continue its across-the-board exchange and cooperation with Venezuela while upholding the above principles. Q: Can you give us any information on the time and venue of the meeting that will possibly take place between the heads of state of China and the US? A: We have noted that President Trump has said on many occasions that he looked forward to meeting again with President Xi. The Chinese side stands ready to stay in close contact with the US side in various ways. Regarding the specifics, I have no information to offer at the moment. Q: It is reported that the former director of the National Cyber Security Centre of the UK's Government Communications Headquarters, wrote in the Financial Times that the NCSC has never found evidence of malicious Chinese state cyber activity through Huawei, and that western countries should not shut out the products and services of a future global tech power. What's your comment on this? A: I have noted relevant reports. Indeed, security issues must be backed up by facts. I believe many of you still have a fresh memory of the PRISM surveillance program. It is not China that conducts eavesdropping and surveillance around the globe, even including on its own allies. Cyber security is a common concern of all countries including European countries and China. If countries can cast aside prejudice, enhance mutual trust and avoid politicizing normal economic behaviors, they will be fully capable of resolving issues of concern. I hope all countries can truly respect market principles of fair and free competition, and foster a fair, just and non-discriminatory market environment for the normal cooperation between companies to ensure the sound development of relevant sectors. Q: US Indo-Pacific Command chief Philip Davidson said on Tuesday that Chinese militarization of the South China Sea has prompted the United States to begin discussing the possibility of relocating US forces and opening bases in the region. I was wondering if you have any comment on this? 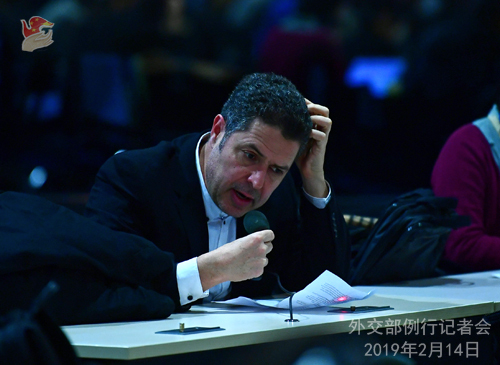 A: The remarks by the US military official are nothing but an attempt to justify the US beefing up military deployment in the South China Sea and the Asia-Pacific. I wonder what "militarization by China" could possibly mean? I am sure you all remember that just a few days ago, two US warships trespassed into waters adjacent to reefs in China's Nansha Islands (also known as the Spratly Islands). We may also compare behaviors of China and the US in the South China Sea. The US not only sent its advanced warships and aircraft all the way across half the globe to the South China Sea, it even brought cutting-edge strategic weapons into these waters. In contrast, since last July, China's maritime rescue center on Nansha Islands have performed 8 search and rescue missions, rescuing 15 people and 2 ships in distress, and saving more than 12 million yuan's worth of assets. The facts speak volumes. Who is seeking militarization? The answer is self-evident. 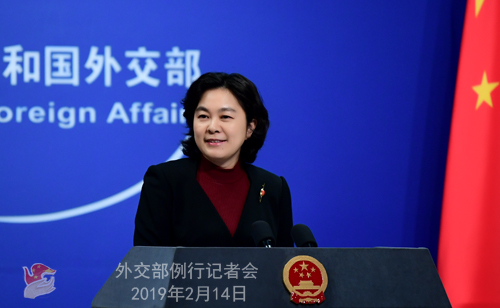 It is hoped that relevant countries will respect the will and effort of China and ASEAN states to maintain the peace and stability of the South China Sea, refrain from provoking trouble and work constructively with others to jointly maintain the peace and stability of these waters. 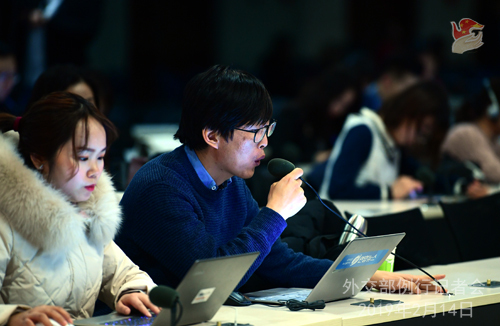 Q: Regarding the trade talks between the US and China, does China believe that an agreement can be reached before the deadline of March 1? How does it view Trump's suggestion that he might be willing to let the deadline slide if a deal is within reach? A: I understand your keen interest in the China-US high-level trade consultations beginning today. I think we all hope that a deal could be reached. At present all we could do is ensure that the two delegations could concentrate on having a good round of consultation and work for a mutually-accepted and mutually-beneficial outcome, which is also to the benefit of the world at large. Q: Will the Chinese leader meet with the US trade delegation in Beijing tomorrow? A: We will release more information on China-US high-level trade consultations in a timely manner. Q: It has been reported that a terror attack in the southern Iranian city Zahedan on Wednesday killed 27 and injured about 13 people. Do you have any comment? A: China has noted relevant reports. We condemn the attack. We offer our condolences to the victims and sympathies to the injured and the bereaved families. Q: It has been reported that US National Security Advisor John Bolton spoke by phone on February 13 with El Salvador's President-elect Nayib Bukele. The two discussed ways to strengthen bilateral friendship and counter Chinese predatory practices in the western hemisphere. What is your comment? A: China and El Salvador established diplomatic ties on the basis of the one-China principle, which is consistent with the trend of the times, conforms with international law and basic norms governing international relations, and serves the fundamental interests of the two countries and peoples. It does not target or affect either's relations with other countries. The Chinese side is glad to see the US and El Salvador developing relations on the basis of mutual respect and non-interference in each other's internal affairs. Likewise, US-El Salvador relations should not jeopardize the maintenance and development of relations between other countries and El Salvador. China has no intention of engaging in geopolitical rivalry in Latin America. Cooperation between China and Latin American countries including El Salvador is for mutual benefit and win-win outcomes. Such cooperation is aimed to realize common development by fully leveraging complementary strengths. Fundamentally, this is also what drives our cooperation. China-Latin America cooperation has created a large number of local jobs and strongly boosted the host country's development and improved people's livelihood. The US accusations against China-Latin America cooperation are completely baseless and unreasonable. We have faith in the people, with whom rests the final judgment. We hope that certain individuals will view China-Latin America cooperation and China-El Salvador relations in an open, inclusive and level-headed manner. Q: A Japanese businessman who was working for the biggest trading company in Japan, which is called Itochu, was detained last February. Could you confirm and give us the reason why he was detained? A: I am not aware of it and would refer you to competent authorities. Q: According to some reports, Deputy Prime Minister and Foreign Minister of Viet Nam Pham Binh Minh had a stopover today in Beijing on his way back after visiting the DPRK. Will Chinese officials meet with him? A: I have no information on that at the moment.